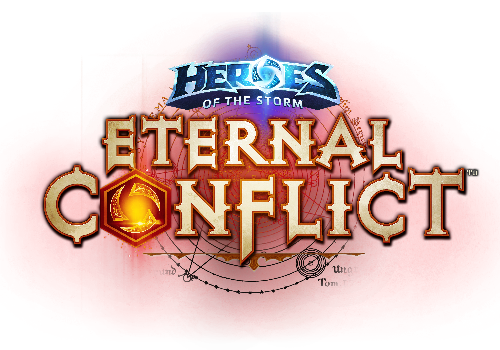 Blizzard Entertainment launched the Eternal Conflict PTR servers. However, there are a few things that won’t be available during PTR testing, so it’s good to read before complaining. Read the patch notes below. This iteration of the PTR is largely intended to make sure everything in the next Heroes patch is working correctly before it is released. While we continue to welcome player feedback during this PTR phase, we are largely focused on uncovering bugs, and changes based on feedback will likely not be incorporated until future patches are released. Any purchases you’ve made in the live version of the game will be available for use on the PTR, including your Heroes, Mounts, and Skins. The same free-to-play Hero Rotation that’s available in the current version of the game will be available on the PTR. However, please note that the in-game Shop has been disabled on the PTR, and no purchases can be made using real money or Gold. The Butcher is not available for play or purchase during this PTR phase. Your Hero and Player Levels, Gold, progression rewards, and any other content you’ve unlocked in Heroes of the Storm thus far will not transfer over to the PTR. Additionally, Hero and Player Levels, Gold, rewards, and other content unlocks earned on the PTR will not transfer over to the current version of the game when the PTR is closed. Players who wish to log in to the PTR can do so using the region selector found just above the big blue Play button on the Battle.net application. Click the region selector to pull up the region list. Select “PTR: Heroes of the Storm” from the region list, and then click Install. Once your installation completes, simply click play to log in to the PTR. Please note: Players must have installed Heroes of the Storm and logged in to the game at least once in order to gain access to the PTR. If the PTR is not available using the steps above, try logging in to Heroes, then close the game client, and attempt to launch the PTR again. If you encounter any bugs while playing on the PTR, please head to the PTR Bug Report forum to share your experiences with us. 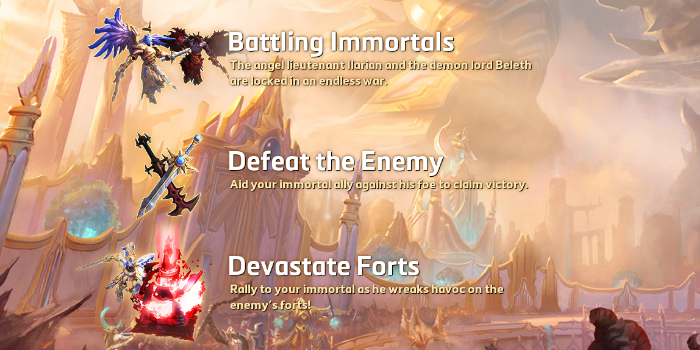 Complete patch notes, listing everything that’s available for testing right now on the Heroes of the Storm PTR, can be found below. It seems that mischievous Treasure Goblins have snuck into the Nexus alongside the arrival of the Burning Hells. These devious creatures are intent on pilfering as much gold as they can carry, and while their numbers are yet unknown, the fortunes they’ve scavenged must be returned! Adventurers that manage to slay any Treasure Goblins they encounter during the Eternal Conflict will be handsomely rewarded. A Treasure Goblin will do anything in its power to evade those it deems hostile, so dispose of these timid beings swiftly, lest they open a portal and slip away! Players will receive a Special Event Quest titled: “Kill a Treasure Goblin!” each day during the Eternal Conflict event. Before the start of a match, any players with an active Special Event Quest will cause a Treasure Goblin to spawn at a random location near their team’s Core. Kill the Treasure Goblin before the pregame timer reaches 0, or it will open a portal and escape the Battleground. Any players with an active Special Event Quest that manage to kill a Treasure Goblin before it escapes will receive 100 Gold for their efforts at the end of the match. Treasure Goblins may spawn on any Battleground, in any matchmaking game mode (Versus A.I., Quick Match, Hero League, Team League). This Special Event Quest is available to all players, whether or not they’ve unlocked Daily Quests by reaching Player Level 6. While players are invited to kill as many Treasure Goblins as they can, this Special Event Quest can only be completed once per day. Incomplete Quests do not stack. The Heroes of the Storm Facebook Page has reached 1 Million Likes! To help celebrate this social media milestone, all players who log in to the game before our next major patch arrives will receive a new, Facebook-themed portrait. Thank you for your support! Any players that redeem the Golden Tiger Mount key found in the Heroes of the Storm Starter Pack will receive an exclusive new Golden Tiger portrait. This portrait will also be retroactively granted to players who redeemed their Golden Tiger Mount key prior to today’s patch. Many Hero and Mount preview panels in the Shop have received updated camera angles, as well as additional lighting polish. AOE Cursors have received additional polish. Lighting during the map event on Garden of Terror has been changed to improve overall visual quality and clarity. The range indicator for the Dragon Knight’s Savage Charge has received visual polish. Brightwing’s in-game Hero portrait has received animation polish. Various Hero Abilities have received additional optimization. Brightwing has received updated art and visual effects to coincide with her Talent rework. 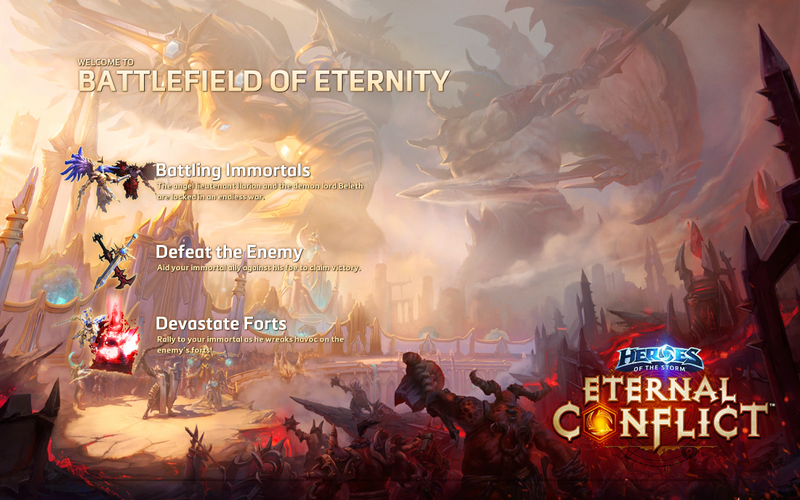 Even the music that plays while viewing the out of game menus has taken a foreboding turn with the Eternal Conflict’s fierce arrival to Heroes of the Storm. Enable music in the Sound Options menu (or press CTRL+M) to listen as the sounds of Sanctuary clash with those of the Nexus. New music has been added for the Battlefield of Eternity Battleground. In-game music for the Sky Temple, Tomb of the Spider Queen, and Garden of Terror Battlegrounds has been updated. Notifications that appear near the top-right corner of the out-of-game menus, such as party invitations and promotional rewards, have received updated art. Hero Level 9 — A new 750 Gold reward has been added. This Gold reward will also be retroactively granted to players for each Hero that reached level 9 prior to today’s patch. Players will not lose any Gold that had already been earned by reaching Hero Levels 15 or 20 prior to today’s patch. The Healing column on the in-game Stats Screen (TAB) has been reworked, and renamed to the Role column. The Role column will track healing done by Support Heroes, as well the total amount of damage taken by Warriors during a game. The Siege Damage column will no longer track damage dealt to uncaptured Mercenaries or other neutral units. A Special Event Quests section has been added to the Quest Log. When a Special Event is taking place, any available Special Event Quests will appear in this section of the Quest Log. Special Event Quests will display any requirements needed to complete them in the Quest Log. Much like a normal Daily Quest, players will be notified when they complete a Special Event Quest on the end-of-game Score Screen. In order to better support Special Event Quests, the Quest Log has been enabled for all Heroes of the Storm players, whether or not they’ve unlocked Daily Quests by reaching Player Level 6. Daily Quests will remain disabled for players that have not reached level 6, but they can still click the Quest Log to view an active Special Event Quest, or their player progress. Players will no longer receive notifications via chat messages or announcer voiceover when an enemy disconnects from, or rejoins a game in any matchmaking mode. However, players in Custom Games will still be notified when enemies disconnect or rejoin. Players will still be notified when an ally leaves or rejoins a game, though notification frequency has been reduced in situations where a teammate repeatedly disconnects and rejoins a game. The difficulty ratings for many Heroes have been updated to better reflect their ease of play. The rings found under Heroes in-game have been scaled to more closely match their hitboxes. Skillshots and Abilities that use an arc pattern will now display their range when hovering the cursor over the associated button on the Ability hotbar. The Lost Vikings have received significant Talent changes. Olaf’s out of combat healing reduced from 10% to 5% of his Health per tick. Viking Hoard has been removed and repurposed as The Lost Vikings’ new Trait. Now also increases Erik’s base Movement Speed by 10%. Movement Speed bonus decay rate reduced from 10% to 5% per second for 4 seconds. Basic Attacks reduce Basic Ability cooldowns by 1 second. Affected targets now miss all Basic Attacks throughout Shield Glare’s duration. Heroes will now cancel movement commands much more quickly if they are unable to reach the final destination. Mounted and non-mounted Heroes will no longer experience sudden slowdowns or hang-ups in movement when pathing around Structures or terrain obstacles. The Countess Kerrigan and Mecha Tassadar Skins will now default to their unique Mounts in regular games after they are purchased. Please note: Players may still choose another Mount for these Skins during Hero Select. Graphic settings for the Mac Mini using an ATI 6630M graphics card will now default to Medium, with a 1280×720 resolution. Several typos and tooltip errors have been corrected. Visual effects for Abathur’s Spike Burst Ability have been appropriately scaled up when cast while using Symbiote on a mechanical spider Minion. Structures disabled by Arthas’ Summon Sindragosa will now properly retain frozen visual effects for the full duration. Fixed a visual issue that could occur when Mecha Tassadar self-casts Plasma Shield while in Mecha Mount form. Corrected a texture issue on the Spectre Illidan Skin. Abathur’s Toxic Nests once again display activation and expiration timers. Fixed several issues affecting Diablo’s Overpower Ability that could cause Heroes to fly out of the Battleground’s playable area. Corrected an issue that could cause Heroes to fly back to their death location upon respawning. Brightwing’s Polymorph now properly interrupts Gazlowe’s Deth Lazor. Using Brightwing’s Phase Shift just as a Core is destroyed will no longer cause the game camera to become stuck at Brightwing’s intended destination. Erik will no longer enter Stealth immediately upon respawning after learning the Spy Games talent. Lost Vikings that die while casting Longboat Raid will no longer respawn at their death locations. Fixed an issue that could allow Rehgar to repeatedly cast Feral Lunge. Sgt. Hammer’s Blunt Force Gun will no longer be placed on reduced cooldown when coming under the effects of Anub’arak Web Blast during Blunt Force Gun’s casting time. Fixed an issue that could cause the Mana costs for Uther’s Basic Abilities to permanently increase under certain circumstances. Abathur once again plays a digging sound when using his Deep Tunnel. Allies will no longer hear Mad Martian Gazlowe’s voiceover globally. Johanna’s death audio will no longer play globally. Fixed an issue that could cause players to search for a match in a game mode other than the one they selected. Fixed an issue that could occasionally cause Mount models to appear in a game lobby. Players that attempt to purchase a Hero while searching for a match in Hero League will now be warned prior to finalizing the transaction that the purchased Hero will not be usable during the upcoming match. Players that are already in a game can no longer be invited to join a party until that game concludes. Fixed an issue that could cause Ability hotkeys to temporarily stop functioning under certain circumstances with Quick Cast set to “On Release”. Clicking near a Hero’s in-game portrait will no longer center the game camera on the Hero. The end of game Score Screen will now display an accurate game time if a match lasts longer than an hour.